Department of Thoracic surgery, UMHAT "St. Marina", Medical University – Varna, Bulgaria. New, modern devices for tissue resection have been introduced in the surgical treatment of thyroid diseases recent years. Aim: To present our experience with the use of the harmonic scalpel in thyroid surgery. Patients and methods: For the period 2008 - 2011, 1398 patients (6 to 74 years old) with various thyroid deseases were operated on in our clinic. The resection was performed through a classic Kocher,s collar incision in 583 patients, using minimally ivasive open access in 641 patients and with video-assisted technique in 174 patients. In all patients a harmonic scalpel device (Ethicon Endosurgery Care Inc) has been used. The length of surgical incision, use of haemostatic instruments and ligatures, extent of resection, need of draining, operative time, intra- and postoperative complications, length of postoperative hospital stay have been examined . Results: The volume of resection ranged from istmusectomy to total thyroidectomy. During all operation haemostatic instruments and ligatures have not been used. Lack of bleeding and shortend operating time - up to 45% were found. The use of draining is significantly reduced, regardless of the extent of resection. There was no increase in the incidence of intra- and postoperative complications.Тhe postoperative stay was significantly reduced. Conclusion: In our opinion, the introduction in use of the harmonic scalpel changes the face of modern thyroid surgery providing reliable hemostasis and shortening the operating time significantly. Key words: Thyroid surgery, harmonic scalpel. Nenkov R, Radev R, Marinova E, Cvetkov N, Semkov A, Petrov B. THE HARMONIC SCALPEL APPLICATION IN THYROID SURGERY. J of IMAB. 2013; 19(1):408-411. 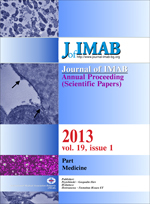 DOI: 10.5272/ jimab.2013191.408. 13. Miccoli P, Donatini G. Use of the Harmonic Scalpel in Thyroid Surgery - Review of the Literature. European Endocrine Disease. 2006:54-58.